You don’t have to go very far and spend so much to help your mom unwind. Simply staying overnight at Summit Hotel Magnolia along Aurora Boulevard, Quezon City is enough to feel rejuvenated. Despite being a boutique hotel, it exudes elegance and style with its interior, furniture and amenities. This hotel is so conducive for family bonding that you’ll be able to bring pure joy to your mom by just spending time with one another without distractions. Cuddle up with her in bed and watch a few series or movies on the hotel TV or on Netflix. Even a simple bonding moment such as that will leave a significant mark on her life forever. Take your mom away from the stresses of city life and household responsibilities, and bring her to this ideal spot for rest and relaxation. Only a stone’s throw away from Manila, Summit Ridge Tagaytay is a welcoming respite for the superwomen of our lives who deserve a break. Avail of their special rate until May 13, 2017 for Super Rooms (Twin or King) priced at PHP 5,477 when you check-in at May 13 and at PHP 4,977 when you check-in at May 14. 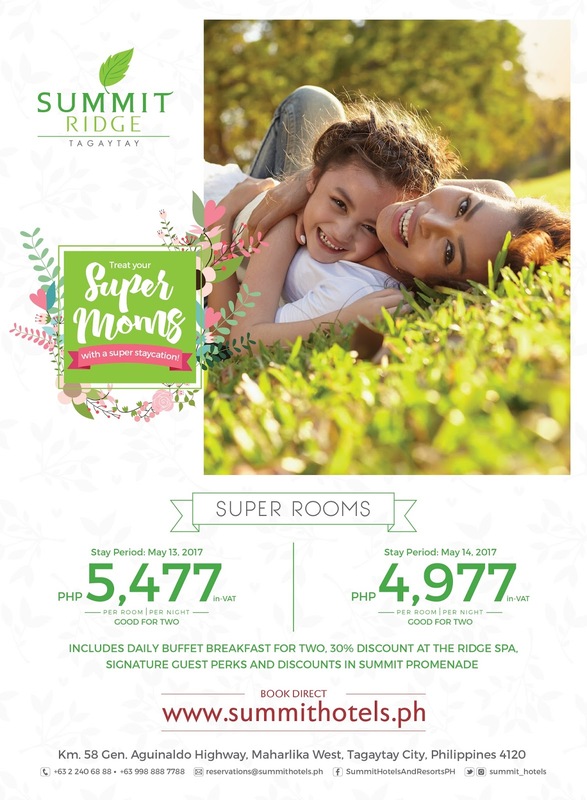 This package includes a daily buffet breakfast for two, guest perks (Griffins, Myra VitaWhite Lotion and Flawless Voucher), a 30% Discount on all spa services at The Ridge Spa, and additional discounts/perks at the Summit Ridge Promenade. Have a lovely dining experience at the onsite restaurant, Sisterfields by Cravings at PHP 699 per head for in-house guests (PHP 799 per head for outsiders). Moms can get a free lunch buffet for every 5 persons who dine with her. Other than being surrounded by the refreshing environment and overlooking a picturesque view of Taal Lake, Summit Ridge offers various services that add to the experience of a laidback weekend getaway. Treat your mom to a few hours of much-needed pampering at the hotel spa for 30% off of any of its services valid only on May 13 and 14, 2017. Throughout the day, your family can explore all of Tagaytay’s must-see sites which are mere minutes away from the hotel, including Sky Ranch Theme Park, Bag of Beans, and the next-door commercial center Summit Ridge Promenade. Mother’s Day is also the perfect time to pack your bags and fly out of the city, even if it’s just to a local destination beyond Luzon. Cebu is one such place that’s perfect for the culture vultures, adventure seekers, and beach bums in your family. If you want to experience all that and more, Summit Circle Cebu should be your hotel of choice. Conveniently located at Cebu’s city center, you are just a drive away from key attractions like the Magellan’s Cross and Basilica del Santo Nino to name a few. Give your mom some relaxing fun under the sun at some of Cebu’s pristine white beaches which are also just a stone’s throw away from the hotel. Summit Galleria in Cebu is the place to spoil your mom with nothing but the best. Be one of the first to ever experience Summit Hotels and Resorts’ newest hotel which boasts of artistry, luxury and contemporary design. Here, you’ll receive nothing less than quality service and elegant amenities. Bond with mom at the relaxing indoor pool or better yet, accompany her to the next-door Robinsons shopping mall for some retail shopping at international designer outlets! There’s no better place to unwind than at Summit Hotels. Show your mom how much you appreciate all she’s done and book your family a weekend stay today at www.summithotels.ph! That looks an awesome place. I'm pretty sure me and my family are going to love it. Try visiting Mactan Hotels, you'll love it too. Anyway, Thanks for sharing!